New York City-based design firm Clouds Architecture Office has proposed a conceptual skyscraper that would hang down from the sky suspended by air cables attached to an asteroid, making it the world’s tallest building. 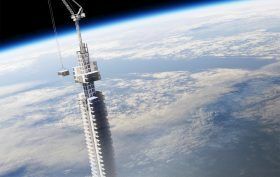 As dezeen learned, the supertall, dubbed Analemma Tower, would not be built on Earth but instead have a “space-based” foundation. Each day, the tower, which would be constructed over Dubai, would travel between the northern and southern hemispheres, with the slowest part of the tower’s trajectory occurring over New York City.